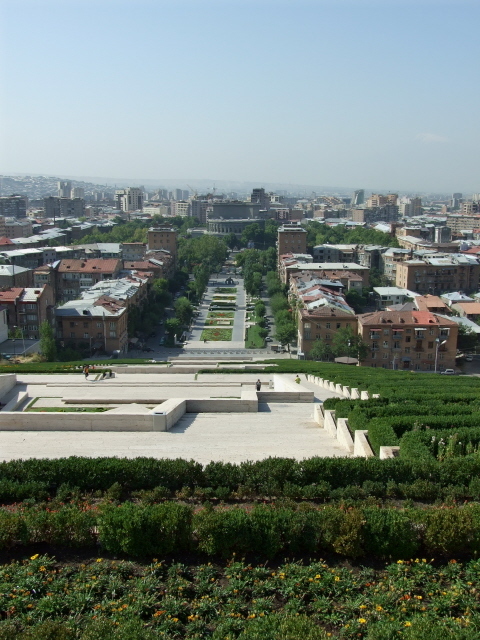 The capital city of Armenia, and home to the country's premier memorial about the Armenian genocide. The city also has a couple of different dark sides, one of them a general feature, namely a disastrous contemporary city planning characterized by demolition of old architecture and ruthless construction of new faceless modern monstrosities. 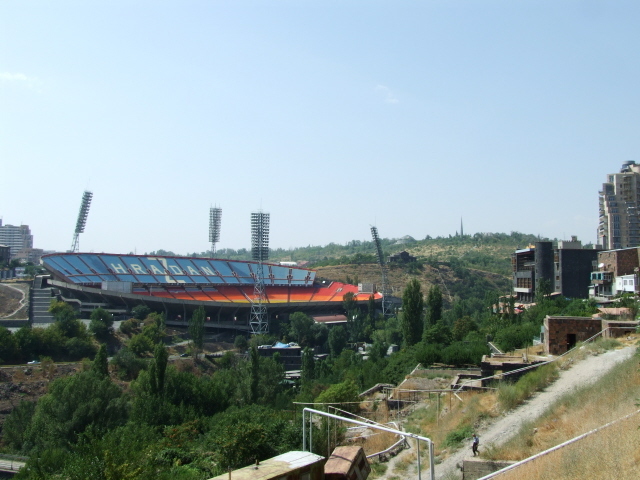 Yerevan can serve as a good base for explorations and tours to other parts of the country too. More background info: With just over 1.1 million inhabitants, Yerevan (or Erivan) is the smallest of the capitals of the three "official" Caucasus countries (those of the "unofficial", break-away provinces, especially Stepanakert in Nagorno-Karabakh, are a lot smaller still). 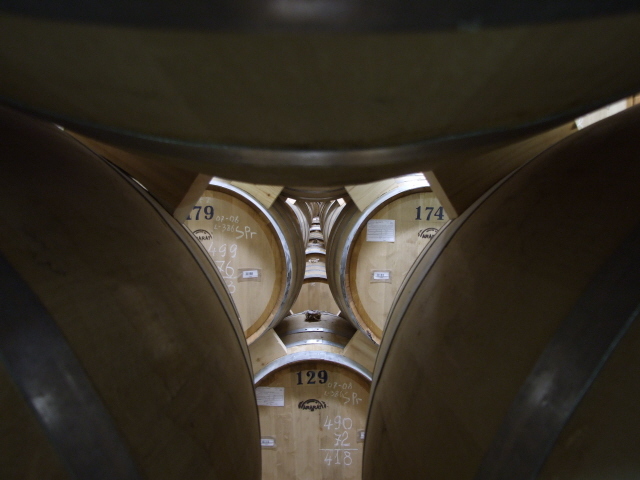 Like the other two, however, it has changed and expanded a lot over the course of its history – and is still changing. One aspect I found all the Caucasian capitals had in common when I visited the region in summer 2010 was the impression of construction work going on everywhere. But only in Yerevan did it involve as much demolition work too. The Soviet era had already brought significant change to the old city, and not for the better. To this day, the main feature of Yerevan is rows and rows of apartment blocks of a distinctly Soviet, i.e. depressingly bleak style. 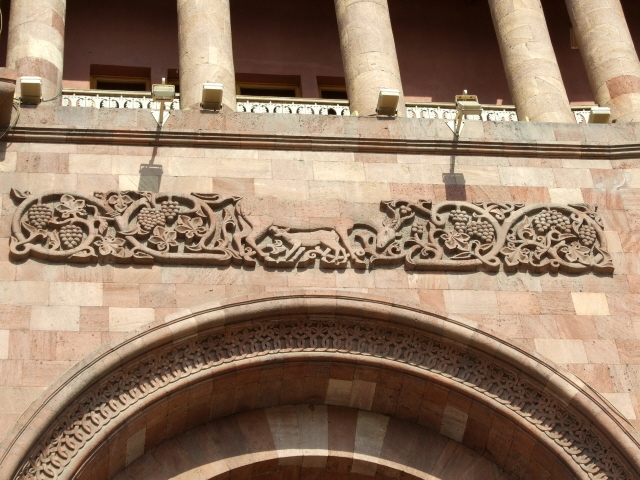 Only in the immediate centre, especially along Abovyan Poghots, some of the grander buildings of the tsarist era were left standing and are still there today, though often not in a particularly well-kept state. 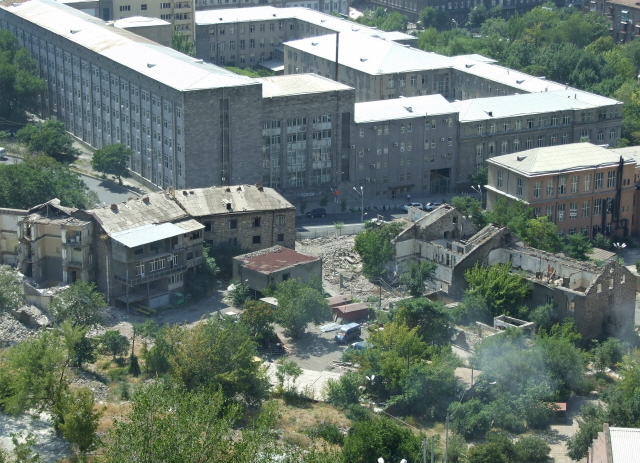 But much worse still: in the side streets in the heart of Yerevan, the current city planners seem determined to demolish what even the Soviets had left standing. I found a whole neighbourhood of such old architecture derelict and partly collapsed, with demolition and construction work rapidly encroaching on what was still standing. 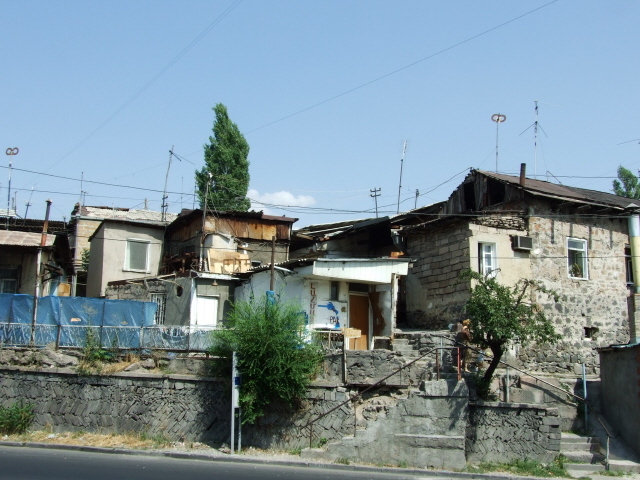 The stretch between Villa Delenda, which stands like the last inhabited beacon of hope (and is run as a charity and B&B – see below), all the way down to Abovyan Poghots, is one of the most depressing sights I've ever had the misfortune to set eyes on. By the time you read this, most of it will probably be gone altogether. In its stead unspeakably ugly high-rises of offices and apartments are mushrooming. Some of the old buildings had numbers painted on every stone of the facades, suggesting that there were plans afoot to remove them and then reconstruct them somewhere else. But even if that is the case it still hardly compensate for the destruction of the authentic old city-ness. That's irreplaceable and not even the sleekest modern apartment blocks will ever have a chance of making up for it. One major element of the city centre's redevelopment was already as good as finished when I visited: the new Hyusisayin Poghota (North Avenue), which slices diagonally – as if cut by a giant chainsaw – through the street grid from the opera and Freedom Square all the way down to Abovyan Poghots near Republic Square. The architecture along this pedestrianized new city centre core with shops and apartments for the well-heeled may not be quite as repulsive as some of the other modern structures nearby, but it's not far off. And the shops are a depressing repetition of the same "international brand names" accumulation that all too often brings indistinguishable facelessness to so many places all around the world. 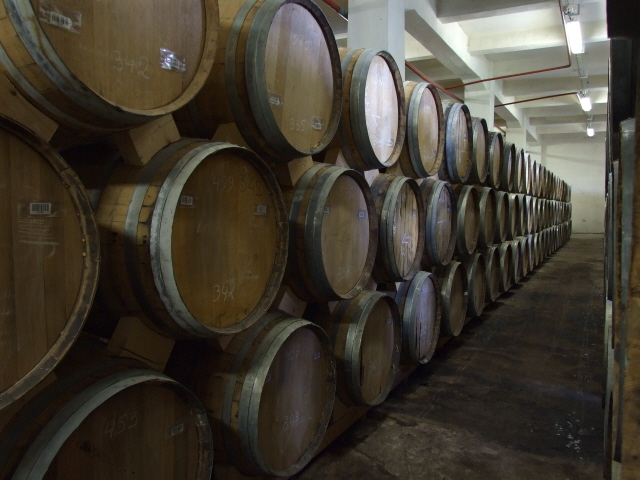 But here it can bring you down even more if you've seen what potential for preservation has been lost. What there is to see: Yerevan has a rather rough "charm", and any first impression is unlikely to be a positive one. The current redevelopment (see above) doesn't at all help to alleviate this – quite on the contrary. Yet you could argue that this very fact makes for a kind of dark sight: the amassed depressing Soviet apartment blocks and the current demolition of older architecture to make room for the construction of modern concrete monstrosities that even beat the Soviet apartment blocks for ugliness. 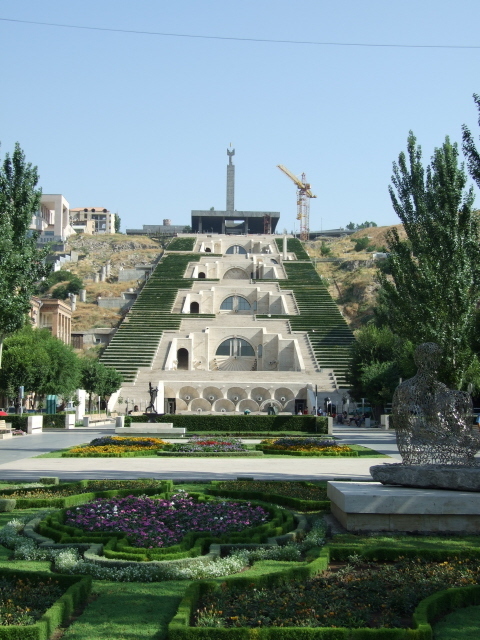 The Cascade is a strange folly of sorts: started in the Soviet days it was left unfinished during Armenia's early years of independence until 2001, when the project was picked up again, as so often with the aid of Armenian Diaspora money. When I visited in August 2010 it was still unfinished at the top. The whole thing is a concrete set of steps going diagonally up a hillside to the north of the city centre with five terraces at different levels. There are flower beds at the bottom and along the way up, and water features are clearly intended to justify the name of the edifice, though when I was there all its fountains were completely dry. There are modern sculptures and an art centre inside, with glass objects a particular focus. 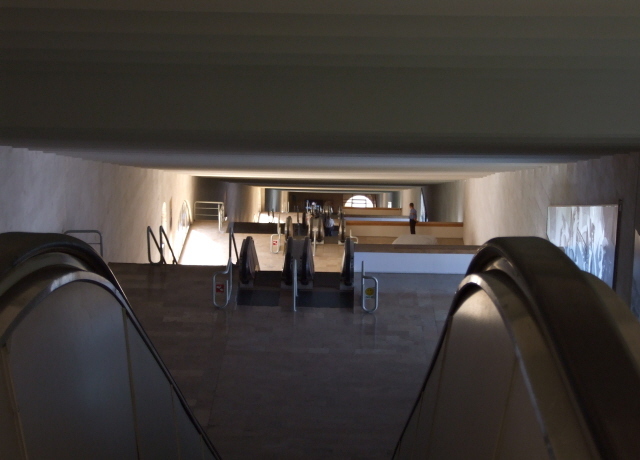 Also inside there are escalators going up to all levels in a kind of underground automated cascade of moving stairways. This looks truly bizarre and science-fiction-y. At the very top is a (very) Soviet monument, a tall column erected to celebrate 50 years of Armenia as part of the Soviet Union. It still stands, though the USSR is history, but the place is hardly a popular or busy one. For the dark tourist the added bonus of going up to the top of the Cascade is that from up there you need only to walk a short distance through the rather depressing Victory Park to get to the Mother Armenia statue. Some dark tourists may also get something out of wandering through the old Kond neighbourhood, on the western edge of the city centre. It is the only remaining part of town that predates all the massive redevelopment of the Tsarist, Soviet and contemporary times. Don't expect any quaint pretty ancient buildings here, though, but rather a kind of shantytown. It's a jumble of mostly low, improvised-looking edifices and shacks with no proper streets, only narrow passageways ... and hence very few cars, which somehow must manage to squeeze through. It's not quite a slum though ... so proper slum tourists might be disappointed too. It rather feels like a village in the middle of the city, where people live a very un-metropolitan life-style; some even grow their own wine on the roofs. A few people were greeting me in a friendly way as I sauntered through this labyrinthine maze of little alleys, others just looked a little surprised. In generally un-touristy Yerevan this is apparently especially un-touristy. I never felt threatened, though, only a little uneasy (as I would in any form of "poverty tourism"). 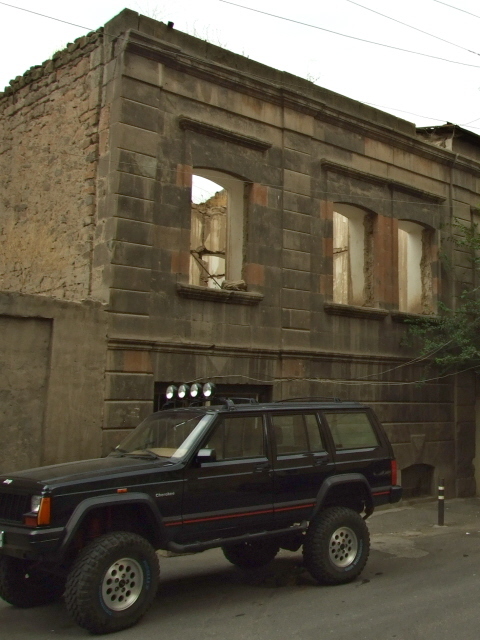 But old Kond is surely a quirky, if shabby, little island to go for a wander in as a counterpoint to the rest of Yerevan. All over the former Soviet Union you can find countless so-called "house museums". These are typically the former residences of somebody famous, be it a writer, artist, scientist or what have you. However, these are often not exactly famous on an international scale, so don't be surprised if you've never heard their names before. Most of these house museums are incredibly boring affairs, unless perhaps you happen to be a huge fan of the artist or whoever in question. Yerevan has one exception to this general rule. The Sergei Paradjanov house museum is a fabulously eccentric and fascinating place by any account. I loved it. Paradjanov – in case this name doesn't immediately mean anything to you either – was a visual artist/sculptor and controversial avant-garde film director, a highly acclaimed colleague of the more internationally renowned Andrei Tarkovsky. During the Soviet days several of Paradjanov's films were banned – and the man himself put in prison repeatedly. This was not so much because of political statements as such but for sexual "immorality". It was when he was prevented from doing any film work that he resorted to other forms of visual arts. He regarded these work as static stand-ins for screenplays for the films he had in his head. In 1988, shortly before his death, Paradjanov moved to Yerevan and began setting up this museum. However, it was only finished and opened to the public after Paradjanov passed away in 1990. On display are numerous sculptures, paintings, collages, etc., as well as furniture and all manner of knickknacks. Some of the sculptures have a decidedly grim theme and can thus count as dark in themselves. Moreover, it's the theme of political and cultural repression that makes the place a worthwhile addition to a dark tourist's itinerary in Yerevan. Location: 15/16 Dzoragyugh Poghots on the western edge of the city centre overlooking the Hrazdan gorge; open daily 10:30 a.m. to 17:30 p.m.; admission 700 AMD, guided tour in English 2500 AMD. Location: Almost in the centre of Armenia, a bit to the north of half-way between it's north-western end and the south-eastern borders with Nagorno-Karabakh and Iran. To the north-east of the city is the large high-altitude body of water that is Lake Sevan, and just to the south, only a couple dozen miles away, beyond the border with Turkey are the slopes of Mt Ararat, the Armenian "holy mountain" now located on the other, "wrong" side of this (closed) border. Access and costs: quite easy to get to from almost anywhere in the country (or from Georgia); not too expensive. Details: Getting to Yerevan is easy enough from most parts of the country, as it serves as THE transport hub of Armenia, so there's plenty of marshrutka (minibus taxi) or bus connections and also a train station, with a few local trains as well as an overnight train to Tbilisi in Georgia, which goes via Gyumri and Vanadzor in such a roundabout route and such slow speed that it's not the most convenient way of travelling. It departs every other day and takes 16 hours, or more if delayed, which frequently happens. It's also easy to get taxis to virtually anywhere in the country and beyond (see under Armenia). Yerevan also has Armenia's only international airport with various connections to other parts of the world, except to the other Caucasus countries or Turkey. 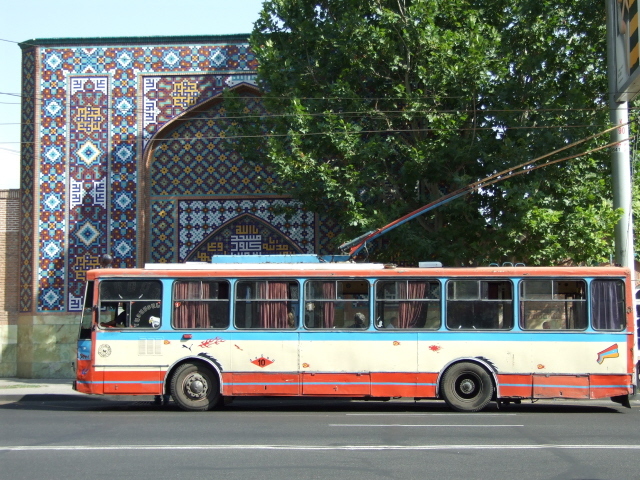 Yerevan does also have a public transport system of buses, marshrutkas (minibus taxis), trolleybuses and even a metro, but unless your accommodation is far out of the centre you will be unlikely to need any of this. Accommodation prices in Yerevan can be more affordable than in Tbilisi (and much cheaper than Baku), and there's a good range, from the luxurious top end down to various budget inns, hostels and guesthouses. A good insider's tip is the B&B at Villa Delenda, which is in the lower mid-range price bracket, but excellent value and full of charm. 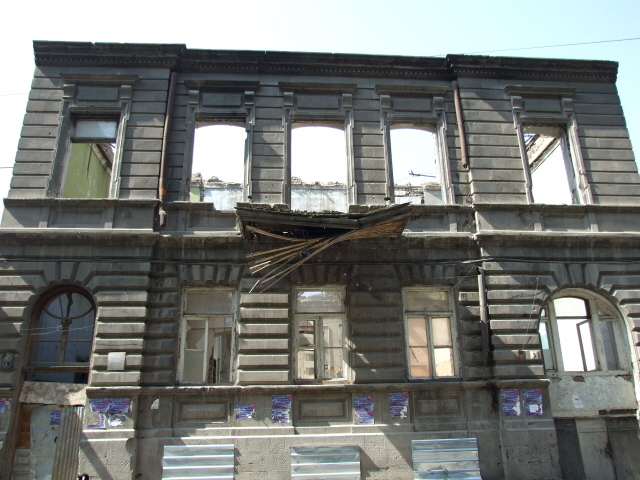 It's in one of the few remaining historic buildings left in Yerevan and thus a unique chance for staying in one. 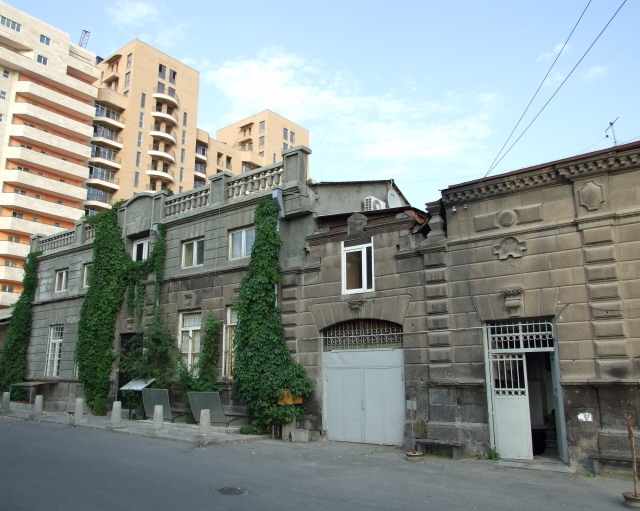 It's located on Yeznik Koghabatsi Street, which runs parallel to Mesrop Mashots Poghota, between Amiryan Street to the south and Tumanyan Street to the north. Villa Delenda is part of a charity, and income from the B&B supports an art school in Spitak, which was devastated by the earthquake of 1988 (see Gyumri and Spitak). So staying there does some good too. In the showroom in the basement you can also purchase ceramics and other arts & crafts made in Spitak. Villa Delenda offers tourists various tours as well. 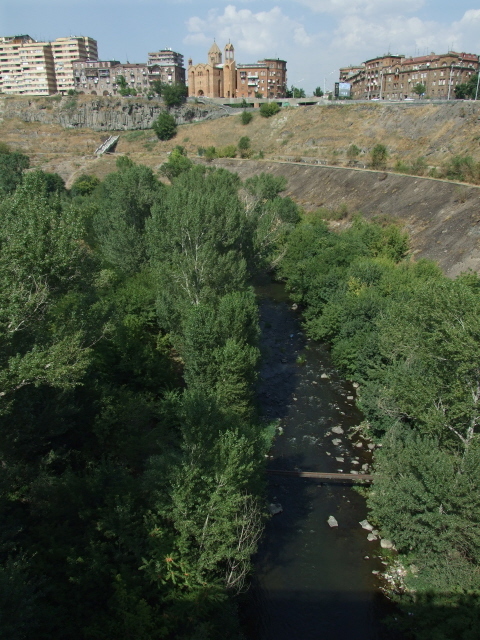 For more info check out their own website (http://villaayghedzor.com/lodging_delenda_en.asp). With regard to food & drink, Yerevan certainly offers the best choice anywhere in Armenia, though here too you'd find it somewhat difficult to discover proper traditional Armenian food that goes beyond the usual gristly khoravats. 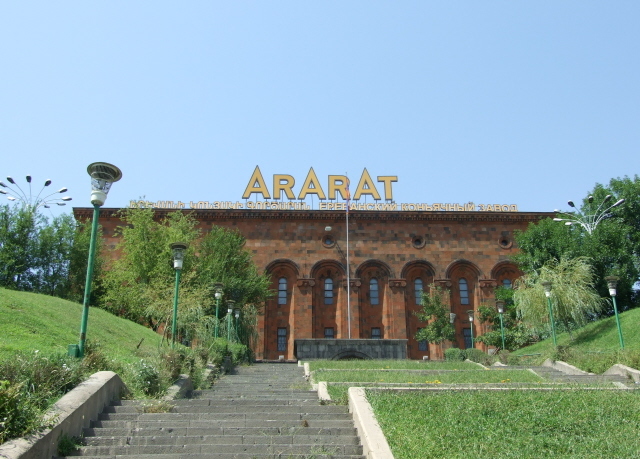 One quite decent exception I found was a place called Ararat Hall, hidden in a side street (Yeznik Koghabatsi – a few blocks up from Villa Delenda), which does a wide range of dishes with a certain emphasis on the Karabakh region. I also had some of the best Georgian food actually in Yerevan (it's popular across the region anyway). Otherwise, Yerevan is a good place to get some relief from the regional food and e.g. go for a curry! Prices are predictably higher than almost anywhere in the provinces, but still quite reasonable. Time required: Yerevan's dark sites can be done in a single day, but if you want to go a bit deeper, and/or use Yerevan as a day for day return excursions, then a few more nights should be planned in. Combinations with other dark destinations: Within an easy day trip reach are Sardarapat and Metsamor, best combined in a single excursion. 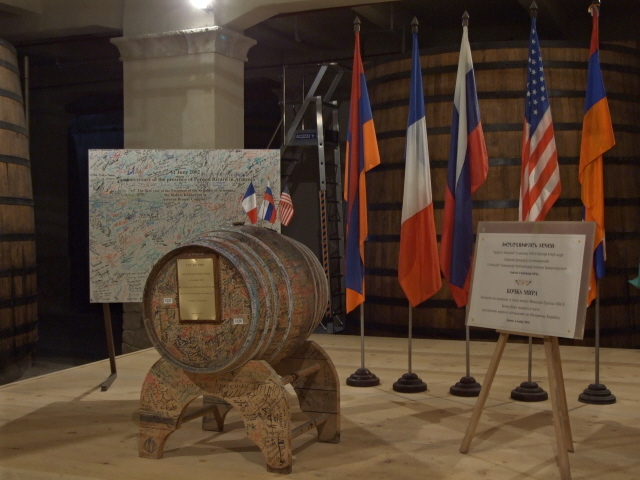 These are offered by various tourism agencies in Yerevan. Rather out of day return trip reach, but easy to get to from Yerevan are Gyumri (and surrounding places) or Sisian – and you can also get to Tbilisi in Georgia in a couple of hours on the road. The overnight train, on the other hand, takes a ludicrous ca. 16 hours. By car you could also get as far as Nagorno-Karabakh, which you can only enter via Armenia in any case. If you'd rather break the journey you could plan a stop-over in either Sisian or Goris. Combinations with non-dark destinations: Yerevan is anything but touristy, and it doesn't make it easy for foreign travellers to fall in love with the place. That said, and the ugly Soviet and current city planning aside (see above), there are still a few hidden, and not so hidden, gems to check out when spending a few days in Yerevan. 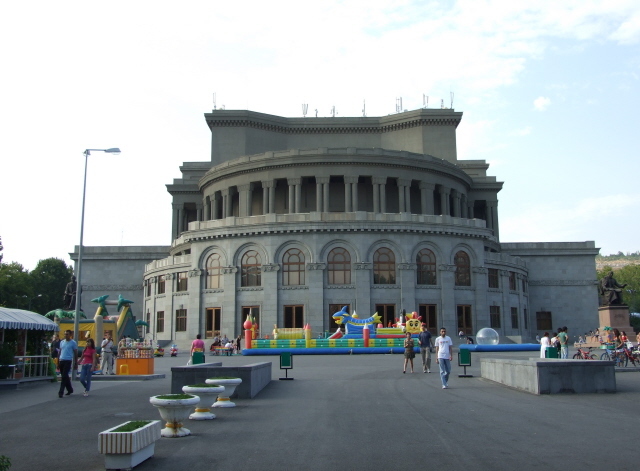 A landmark building is the opera in the northern part of the inner city, close to the Cascade. 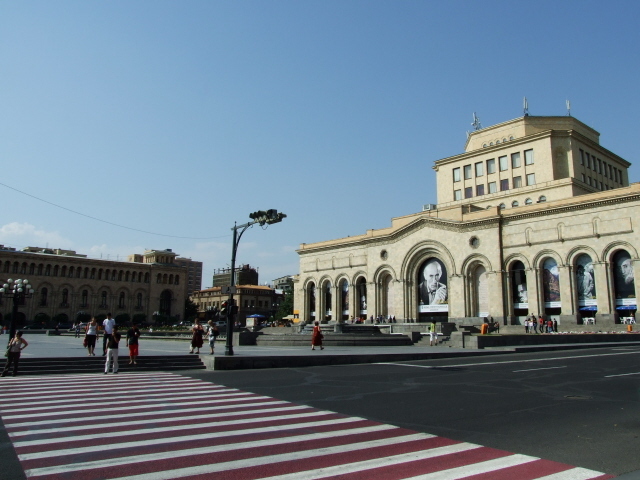 At the other end, the architecturally least spoiled spot in the city is Republic Square in the southern part, with its very Armenian-style red stone government buildings and the History Museum and National Art Gallery. 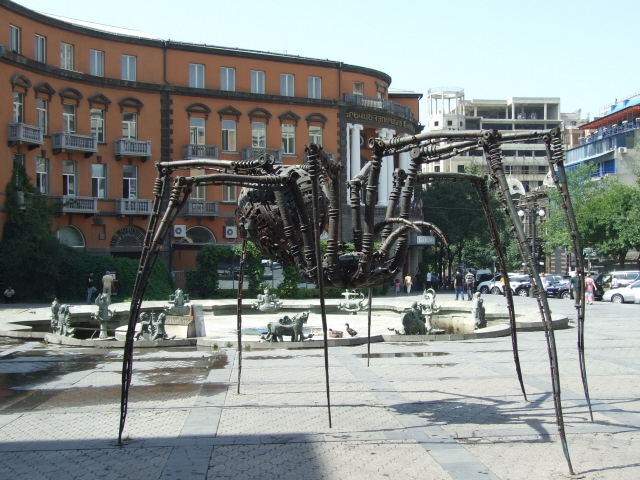 As art is generally held in high esteem in Armenia and especially in Yerevan you can also see many a public sculpture just walking around, some of them strikingly modern – the most remarkable I found was the scarily giant iron spider on a Aznavour Square, off Abovyan Poghots, in front of the Moskva cinema. A largely hidden gem is the pretty Blue Mosque off 12 Mesrop Mashtots Poghota, opposite the covered food market. From the road you can only see the tiled gate and the top of the minaret – but beyond lies a garden surrounded by low buildings (a madrasah) and the mosque itself. It's run by an Iranian organization, who were also undertaking some further restoration work when I visited I spoke with a very approachable Iranian – whose English was remarkably fluent – who was eager to provide some information … without trying to push me towards Islam ;-)). 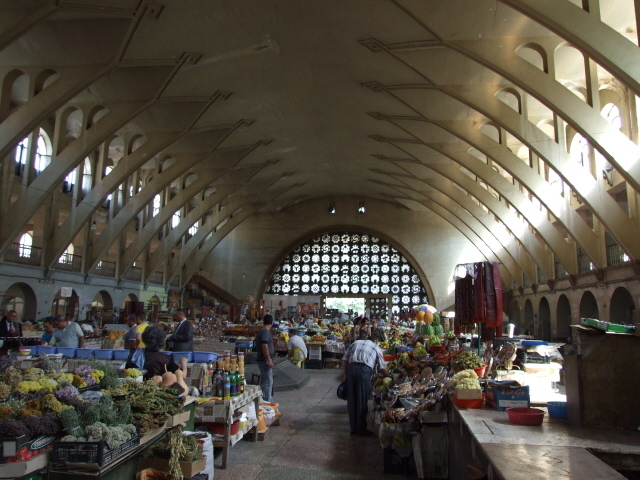 The market hall opposite is also well worth a look. Check out the big bunches of herbs and the piles of cheeses! 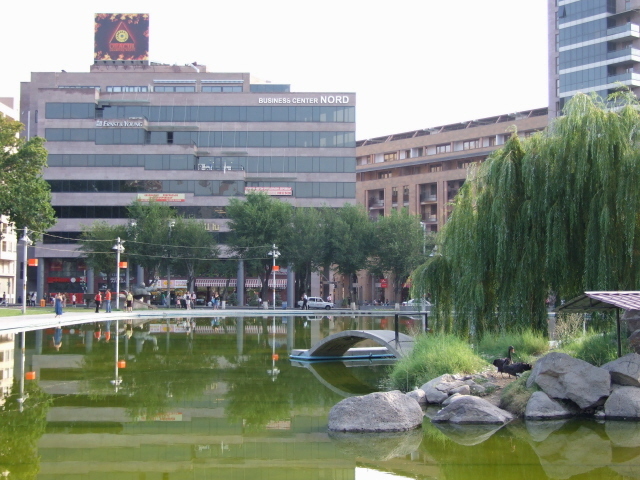 The main pleasure of Yerevan, however, is its street café culture – and the tree-shaded stretch of park-like avenue leading west from Republic Square is possibly the most pleasant, especially on a hot summer day, when the shade and the water fountains provide a bit of cooling relaxation.